As one of the top woman-owned business in the US, Omega World Travel's commitment to diversity does not rest simply with our multicultural work force but also with our approach to business opportunities. We strive to align ourselves with other diverse business partners to promote the same in supply chain management. Multicultural business partners not only support our everyday operations, but ultimately lead to our success. Omega World Travel features a diverse client base, including corporate organizations and government agencies, minority- and women-owned small businesses, as well as larger Fortune 500-size accounts. No matter the size or industry, we offer each client the same quality service to assure successful, cost-effective and efficient travel programs. 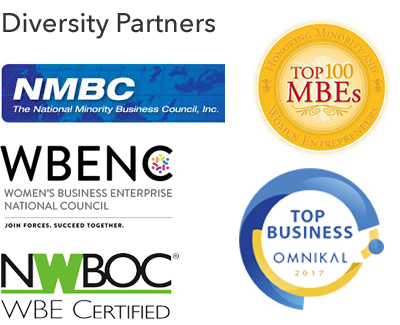 Omega World Travel's diversity qualifications include certifications as a women-owned business enterprise by the Women's Business Enterprise National Council and National Minority Business Council, and designation by the National Women Business Owners Corporation as a private and public sector contractor and supplier. Omega World Travel has been repeatedly recognized by DiversityBusiness.com as one of the top diversity businesses in the U.S. President and CEO Gloria Bohan has been awarded "Business Woman of the Year" by Diversity Best Practices, an organization involved in uniting, networking and promoting nearly eight million business women.